Adding natto to soba soup gives the broth a creamy texture and is a great way to introduce someone to natto. The Broth: Dashi, Kombu, Soy Sauce, Sugar and Salt. Or just use a japanese noodle soup base. The Soup: Soba noodles, Kombucha Squash (Japanese Pumpkin), Green onion, any and all hearty green vegetables that you don’t know what to do with. I’ve made soba broth from kale, chrysanthemum leaves, collard greens, broccoli, anything and everything. Mix the natto in a bowl so that it begins to develop sticky strands. 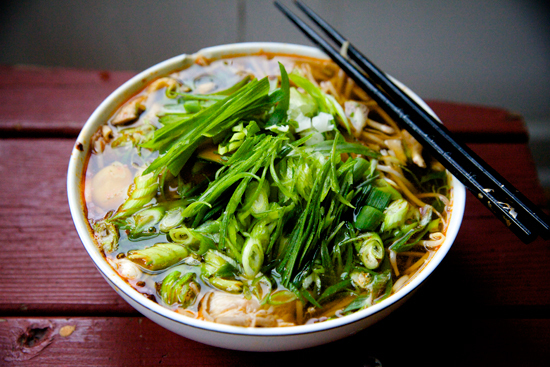 Add the boiled soba noodles, boiled kombucha, oyster mushrooms and crack an egg into the bowl. Top with long and chopped green onion. I would not have thought to add nattou to soba noodle soup but I am going to have to try it! It’s amazing. I eat this at least once a week for lunch. Great idea in using soba for soup easy to make and great for the cold. I have never seen those noodles prreaepd for a warm dish before. Usually I see them prreaepd cold (great summer dish) and served with a variety of spicy sauces on a basket (zarusoba). This is definitely a nice alternative given the upcoming season!